While many might be familiar with carrot soup recipes flavored with Indian spices like cumin, coriander or gram masala, this soup uses the rich flavor of coconut milk, the tanginess of apple cider, and the oaky bite of Chardonnay to make a creamy and flavorful veggie-based soup. Besides being delicious, this soup is actually filled with many aphrodisiac properties and is good for your health. 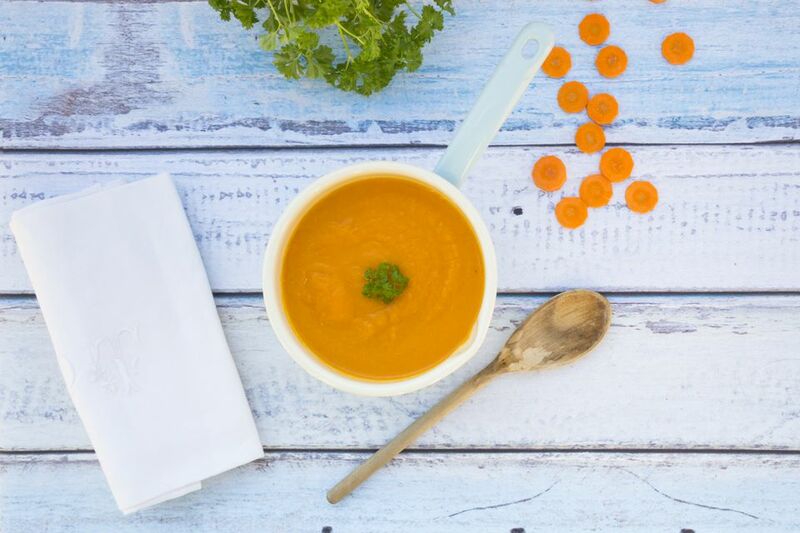 Carrots alone are overwhelmingly good for you for several reasons. By adding the apples, ginger, garlic and coconut milk this earns a big thumb's up to serve for a date night for two. Due to the long slow cooking, feel free to include a variable amount of vegetable broth while cooking. Try adding six cups to begin with and if needed over time, add more to thin it out if it gets too thick. If you enjoy you can also use more coconut milk to thin it out while adding heaps of flavor. Melt butter in a large pot and add the diced onion. Sauté until onion begins to soften and toss the garlic and thyme into the pot. Once onions are translucent and slightly browned pour in the apple cider and chardonnay. Add either the shredded or roasted carrots. Cook for several minutes and then add 4-5 cups of vegetable broth. Let simmer on medium heat for about 10 minutes until the carrots are significantly soft. Use an immersion blender if you have one or transfer batches to a food processor to puree. Once it has reached a smoother consistency, cook on medium heat until slightly bubbling and then mix in the grated ginger, coconut milk and half the broth. Stirring frequently bring heat back up to almost boiling and incorporate a few more cups of broth. Next add salt and pepper and reduce heat to medium-low, cover and cook for about an hour. Taste and add seasoning as needed and more broth. Simmer on low for as long as you can to infuse all the flavors. To serve, ladle into bowls, drizzle in some crème fraiche and ground sweet and spicy nuts.